Updated. It seems that we are now up to 38 self-reinforcing feeback loops now. I’m often accused of cherry picking the information in this ever-growing essay. I plead guilty, and explain myself in this essay posted 30 January 2014. The response of politicians, heads of non-governmental organizations, and corporate leaders remains the same. They’re mired in the dank Swamp of Nothingness. As Hallor Thorgeirsson, a senior director with the United Nations Framework Convention on Climate Change, said on 17 September 2013: “We are failing as an international community. We are not on track.” These are the people who know about, and presumably could do something about, our ongoing race to disaster (if only to sound the alarm). Tomlin’s line is never more germane than when thinking about their pursuit of a buck at the expense of life on Earth. Mainstream scientists minimize the message at every turn. As we’ve known for years, scientists almost invariably underplay climate impacts. And in some cases, scientists are aggressively muzzled by their governments. I’m not implying conspiracy among scientists. Science selects for conservatism. Academia selects for extreme conservatism. These folks are loathe to risk drawing undue attention to themselves by pointing out there might be a threat to civilization. Never mind the near-term threat to our entire species (they couldn’t care less about other species). If the truth is dire, they can find another, not-so-dire version. The concept is supported by an article in the February 2013 issue of Global Environmental Change pointing out that climate-change scientists routinely underestimate impacts “by erring on the side of least drama” (and see an overview of this phenomenon from 21 May 2014). Almost everybody reading these words has a vested interest in not wanting to think about climate change, which helps explain why the climate-change deniers have won. Ever late to the party, the Intergovernmental Panel on Climate Change (IPCC) admits global warming is irreversible without geoengineering in a report released 27 September 2013. On 22 April 2014, Truth-out correctly headlines their assessment, “Intergovernmental Climate Report Leaves Hopes Hanging on Fantasy Technology.” Time follows up two days later with a desperate headline, “NASA Chief: Humanity’s Future Depends On Mission To Mars” (first up: greenhouses on Mars). Aspointed out in the 5 December 2013 issue of Earth System Dynamics, known strategies for geoengineering are unlikely to succeed (“climate geo-engineering cannot simply be used to undo global warming“). “Attempts to reverse the impacts of global warming by injecting reflective particles into the stratosphere could make matters worse,” according to research published in the 8 January 2014 issue of Environmental Research Letters. In addition, as described in the December 2013 issue of Journal of Geophysical Research: Atmospheres, geoengineering may succeed in cooling the Earth, it would also disrupt precipitation patterns around the world. Furthermore, “risk of abrupt and dangerous warming is inherent to the large-scale implementation of SRM” (solar radiation management), as pointed out in the 17 February 2014 issue of Environmental Research Letters. Finally, “schemes to minimize the havoc caused by global warming by purposefully manipulating Earth’s climate are likely to either be relatively useless or actually make things worse,” judging from research published in the 25 February 2014 issue of Nature Communications. As it turns out, the public isn’t impressed, either: Research published in the 12 January 2014 issue of Nature Climate Change “reveals that the overall public evaluation of climate engineering is negative.” Despite pervasive American stupidity, the public correctly interprets geo-engineering in the same light as the scientists, and contrary to the techno-optimists. The IPCC operates with a very conservative process and produces very conservative reports. And then governments of the world meddle with the reports to ensure Pollyanna outcomes, as reported by a participant in the process (also see Nafeez Ahmed’s 14 May 2014 report in the Guardian). According to David Wasdell’s May 2014 analysis, which includes a critique of the IPCC’s ongoing lunacy, “equilibrium temperature increase predicted as a result of current concentration of atmospheric greenhouse gasses is already over 5°C.” I see no way for humans to survive such a rise in global-average temperature. If you’re too busy to read the evidence presented below, here’s the bottom line: On a planet 4 C hotter than baseline, all we can prepare for is human extinction (from Oliver Tickell’s 2008 synthesis in the Guardian). Tickell is taking a conservative approach, considering humans have not been present at 3.5 C above baseline (i.e., the beginning of the Industrial Revolution, commonly accepted as 1750). I cannot imagine a scenario involving a rapid rise in global-average temperature and also habitat for humans. According to the World Bank’s 2012 report, “Turn down the heat: why a 4°C warmer world must be avoided” and an informed assessment of “BP Energy Outlook 2030” put together by Barry Saxifrage for the Vancouver Observer, our path leads directly to the 4 C mark. The 19th Conference of the Parties of the UN Framework Convention on Climate Change (COP 19), held in November 2013 in Warsaw, Poland, was warned by professor of climatology Mark Maslin: “We are already planning for a 4°C world because that is where we are heading. I do not know of any scientists who do not believe that.” Adding to planetary misery is a paper in the 16 December 2013 issue of the Proceedings of the National Academy of Sciences concluding that 4 C terminates the ability of Earth’s vegetation to sequester atmospheric carbon dioxide. I’m not sure what it means to plan for 4 C (aka extinction). I’m not impressed that civilized scientists claim to be planning for it, either. But I know we’re human animals, and I know animals require habitat to survive. When there is no ability to grow food or secure water, humans will exit the planetary stage. Perfluorotributylamine (PFTBA) is 7,100 times more powerful than carbon dioxide as a greenhouse gas in the atmosphere, and it persists hundreds of years in the atmosphere. It also ignores the irreversible nature of climate change: Earth’s atmosphere will harbor, at minimum, the current level of atmospheric carbon dioxide concentration for at least the next 1,000 years, as indicated in the 28 January 2009 issue of the Proceedings of the National Academy of Sciences. All of the above information fails to include the excellent work by Tim Garrett, which points out that only complete collapse avoids runaway greenhouse. Garrett reached the conclusion in a paper submitted in 2007 (personal communication) and published online by Climatic Change in November 2009 (outcry from civilized scientists delayed formal publication until February 2011). The paper remains largely ignored by the scientific community, having been cited fewer than ten times since its publication. On the topic of tipping points, we crossed the Rubicon in 2007 at about 0.76 C warming. At this point, according to David Spratt’s excellent September 2013 report, “Is Climate Already Dangerous?”, not only had Arctic sea-ice passed its tipping point, but the Greenland Ice Sheet was not far behind, as the Arctic moves to sea-ice-free conditions in summer (the U.S. Navy predicts an ice-free Arctic by summer 2016, a year later than expected by the United Kingdom Parliament, whichpoints out that the six lowest September ice extents have occurred in the last six years, 2006-2012, and now we can add 2013 and 2014 to the list). Glaciologist Jason Box, an expert on Greenland ice, agrees. Box was quoted in a 5 December 2012 article in the Guardian: “In 2012 Greenland crossed a threshold where for the first time we saw complete surface melting at the highest elevations in what we used to call the dry snow zone. … As Greenland crosses the threshold and starts really melting in the upper elevations it really won’t recover from that unless the climate cools significantly for an extended period of time which doesn’t seem very likely.” (In January 2013, Box concluded we’ve locked in 69 feet — 21 meters — of sea-level rise.) Indeed, as stated that same year in the September issue of Global Policy, “because of increasing temperatures due to GHG emissions a suite of amplifying feedback mechanisms, such as massive methane leaks from the sub-sea Arctic Ocean, have engaged and are probably unstoppable.” By December 2013, the disappearance of Greenland’s ice had accelerated to five times the pace of a few years previously, and IPCC was acknowledging they’d been far too conservative with past estimates. Continued conservatism is buttressed by research reported in the 16 March 2014 issue of Nature Climate Change indicating melting of Greenland ice accounts for about one-sixth of recent sea-level rise and also by research published in the 18 May 2014 issue of Nature Geoscience indicating Greenland’s icy reaches are far more vulnerable to warm ocean waters from climate change than had been thought. If you think we’ll adapt, think again. The rate of evolution trails the rate of climate change by a factor of 10,000, according to a paper in the August 2013 issue of Ecology Letters. And it’s not as if extinction events haven’t happened on this planet, as explained in the BBC program, The Day the Earth Nearly Died. The rate of climate change clearly has gone beyond linear, as indicated by the presence of the myriad self-reinforcing feedback loops described below, and now threatens our species with extinction in the near term. As Australian biologist Frank Fenner said in June 2010: “We’re going to become extinct,” the eminent scientist says. “Whatever we do now is too late.” Anthropologist Louise Leakey ponders our near-term demise in her 5 July 2013 assessment at Huffington Post and her father Richard joins the fray in this video from December 2013 (see particularly 1:02:18 – 1:02:56). Canadian wildlife biologist Neil Dawe joins the party of near-term extinction in an interview 29 August 2013 and musician-turned-activist Sir Bob Geldof joins the club in a Daily Star article from 6 October 2013. Health officials add their voices to the discussion about extinction in late March 2014, although they view 4 C as a problem to be dealt with later. In the face of near-term human extinction, most Americans view the threat as distant and irrelevant, as illustrated by a 22 April 2013 article in the Washington Post based on poll results that echo the long-held sentiment that elected officials should be focused on the industrial economy, not far-away minor nuisances such as climate change. This essay brings attention to recent projections and positive feedbacks. I presented much of this information at the Bluegrass Bioneers conference (Alex Smith at Radio Ecoshock evaluates my presentation here). More recently, I presented an updated version in a studio in Bolingbrook, Illinois. All information and sources are readily confirmed with an online search, and links to information about feedbacks can be found here. These assessments fail to account for significant self-reinforcing feedback loops (i.e., positive feedbacks, the term that implies the opposite of its meaning). The IPCC’s vaunted Fifth Assessment continues the trend as it, too, ignores important feedbacks (also listen here). As with prior reports, the Fifth Assessment “has been altered after the expert review stage, with changes added that downplay the economic impacts of a warming planet.” Consider, for example, the failure to mention Arctic ice in the Working Group Summary released 31 March 2014 (additional links here). On a positive note, major assessments fail to account for economic collapse. However, due to the four-decade lag between emissions and temperature rise, the inconvenient fact that the world has emitted more than twice the industrial carbon dioxide emissions since 1970 as we did from the start of the Industrial Revolution through 1970, and also due to the feedback loops described below, I strongly suspect it’s too late for economic collapse to extend the run of our species. Indeed, as pointed out by Bruce Melton at Truthout in a 26 December 2013 piece featuring climate scientist Wallace Broeker: “today we are operating on atmospheric concentrations of greenhouse gases from the 1970s. In the last 29 years we have emitted as many greenhouse gases as we emitted in the previous 236 years. Because of the great cooling effect of the oceans, we have not yet begun to see the warming that this recent doubling of greenhouse gases will bring.” Greenhouse gas emissions continue to accelerate even as the world’s industrial economy slows to a halt: Emissions grew nearly twice as fast during the first decade of the new millennium as in the previous 30 years, as reported in the 11 April 2014 issue of The Guardian. The 40-year has been evident since at least 1938, when Guy Callendar pointed out influence of rising carbon dioxide on temperature in a paper in the Quarterly Journal of the Royal Meteorological Society. The hand-drawn figure from the paper shown below clearly illustrates a rise in global-average temperature beginning about 1915, roughly 40 years after the consumption of fossil fuels increased substantially. Callendar’s work was used by J.S. Sawyer in a 1972 paper published in Nature to predict an “increase of 25% CO2 expected by the end of the century … [and] … an increase of 0.6°C in the world temperature” with stunning accuracy. As described by the United Nations Advisory Group on Greenhouse Gases in 1990, “Beyond 1 degree C may elicit rapid, unpredictable and non-linear responses that could lead to extensive ecosystem damage” (link mirrored here). James Hansen and crew finally caught up to the dire nature of 1 C warming 23 years after the U.N. warning, 28 self-reinforcing feedback loops too late. 1. Methane hydrates are bubbling out the Arctic Ocean (Science, March 2010). As described in a subsequent paper in the June 2010 issue of Geophysical Research Letters, a minor increase in temperature would cause the release of upwards of 16,000 metric tons of methane each year. Storms accelerate the release, according to research published in the 24 November 2013 issue of Nature Geoscience. According to NASA’s CARVE project, these plumes were up to 150 kilometers across as of mid-July 2013. Global-average temperature is expected to rise by more than 4 C by 2030 and 10 C by 2040 based solely on methane release from the Arctic Ocean, according to Sam Carana’s research (see especially Image 24). Whereas Malcolm Light’s 9 February 2012 forecast of extinction of all life on Earth by the middle of this century appears premature because his conclusion of exponential methane release during summer 2011 was based on data subsequently revised and smoothed by U.S. government agencies, subsequent information — most notably from NASA’s CARVE project — indicates the grave potential for catastrophic release of methane. (I doubt industrial civilization manages to kill all life on Earth, although that clearly is the goal.) Catastrophically rapid release of methane in the Arctic is further supported by Nafeez Ahmed’s thorough analysis in the 5 August 2013 issue of the Guardian as well as Natalia Shakhova’s 29 July 2013 interview with Nick Breeze (note the look of abject despair at the eight-minute mark). In early November 2013, methane levels well in excess of 2,600 ppb were recorded at multiple altitudes in the Arctic. Later that same month, Shakhova and colleagues published a paper in Nature Geoscience suggesting “significant quantities of methane are escaping the East Siberian Shelf” and indicating that a 50-billion-tonne “burst” of methane could warm Earth by 1.3 C. Such a burst of methane is “highly possible at any time.” By 15 December 2013, methane bubbling up from the seafloor of the Arctic Ocean had sufficient force to prevent sea ice from forming in the area. Nearly two years after his initial, oft-disparaged analysis, Malcolm Light concluded on 22 December 2013, “we have passed the methane hydrate tipping point and are now accelerating into extinction as the methane hydrate ‘Clathrate Gun’ has begun firing volleys of methane into the Arctic atmosphere.” According to Light’s analysis in late 2013, the temperature of Earth’s atmosphere will resemble that of Venus before 2100. Two weeks later, in an essay stressing near-term human extinction, Light concluded: “The Gulf Stream transport rate started the methane hydrate (clathrate) gun firing in the Arctic in 2007 when its energy/year exceeded 10 million times the amount of energy/year necessary to dissociate subsea Arctic methane hydrates.” Not surprisingly, the clathrate gun began firing in 2007, the same year the extent of Arctic sea ice reached a tipping point. The importance of methane cannot be overstated. Increasingly, evidence points to a methane burst underlying the Great Dying associated with the end-Permian extinction event, as pointed out in the 31 March 2014 issue of Proceedings of the National Academy of Sciences. 2. Warm Atlantic water is defrosting the Arctic as it shoots through the Fram Strait (Science, January 2011). Extent of Arctic sea ice passed a tipping point in 2007,according to research published in the February 2013 issue of The Cryosphere. On 6 October 2012, Truth-out cites Peter Wadhams, professor of ocean physics at Cambridge University: “The Arctic may be ice-free in summer as soon as 2015. Such a massive loss would have a warming effect roughly equivalent to all human activity to date. In other words, a summer ice-free Arctic could double the rate of warming of the planet as a whole.” Subsequent melting of Arctic ice is reducing albedo, hence enhancing absorption of solar energy. “Averaged globally, this albedo change is equivalent to 25% of the direct forcing from CO2 during the past 30 years,” according to research published in the 17 February 2014 issue of the Proceedings of the National Academy of Sciences. Destabilization of the deep circulation in the Atlantic Ocean may be “spasmodic and abrupt rather than a more gradual increase” as earlier expected, according to a paper published in the 21 February 2014 issues of Science. Models continue to underestimate relative to observations, as reported in the 10 March 2014 issue of Geophysical Research Letters. 3. Siberian methane vents have increased in size from less than a meter across in the summer of 2010 to about a kilometer across in 2011 (Tellus, February 2011). According to a paper in the 12 April 2013 issue of Science, a major methane release is almost inevitable, which makes me wonder where the authors have been hiding.Almost inevitable, they report, regarding an ongoing event. Trees are tipping over and dying as permafrost thaws, thus illustrating how self-reinforcing feedback loops feed each other. 7. Methane is being released from the Antarctic, too (Nature, August 2012). According to a paper in the 24 July 2013 issue of Scientific Reports, melt rate in the Antarctic has caught up to the Arctic and the West Antarctic Ice Sheet is losing over 150 cubic kilometres of ice each year according to CryoSat observations published 11 December 2013, and Antarctica’s crumbling Larsen B Ice Shelf is poised to finish its collapse, according to Ted Scambos, a glaciologist at the National Snow and Ice Data Center at the annual meeting of the American Geophysical Union. The rate of loss during the period 2010-2013 was double that during the period 2005-2010,according to a paper scheduled for publication in Geophysical Research Letters.Further confirmation of large methane releases is revealed by noctilucent clouds over the southern hemisphere from 21 November 2013 to 6 December 2013. 8. Russian forest and bog fires are growing (NASA, August 2012), a phenomenon consequently apparent throughout the northern hemisphere (Nature Communications, July 2013). The New York Times reports hotter, drier conditions leading to huge fires in western North America as the “new normal” in their 1 July 2013 issue. A paper in the 22 July 2013 issue of the Proceedings of the National Academy of Sciences indicates boreal forests are burning at a rate exceeding that of the last 10,000 years. Los Alamos National Laboratory catches on during same month. 13. Summer ice melt in Antarctica is at its highest level in a thousand years: Summer ice in the Antarctic is melting 10 times quicker than it was 600 years ago, with the most rapid melt occurring in the last 50 years (Nature Geoscience, April 2013). According to a paper in the 4 March 2014 issue of Geophysical Research Letters — which assumes relatively little change in regional temperature during the coming decades — “modeled summer sea-ice concentrations decreased by 56% by 2050 and 78% by 2100″ (Robert Scribbler’s in-depth analysis is here). Citing forthcoming papers in Science and Geophysical Research Letters, the 12 May 2014 issue of theNew York Times reported: “A large section of the mighty West Antarctica ice sheet has begun falling apart and its continued melting now appears to be unstoppable. … The new finding appears to be the fulfillment of a prediction made in 1978 by an eminent glaciologist, John H. Mercer of the Ohio State University. He outlined the vulnerable nature of the West Antarctic ice sheet and warned that the rapid human-driven release of greenhouse gases posed ‘a threat of disaster.’” Although scientists have long expressed concern about the instability of the West Antarctic Ice Sheet (WAIS), a research paper published in the 28 August 2013 of Nature indicates the East Antarctic Ice Sheet (EAIS) has undergone rapid changes in the past five decades. The latter is the world’s largest ice sheet and was previously thought to be at little risk from climate change. But it has undergone rapid changes in the past five decades, signaling a potential threat to global sea levels. The EAIS holds enough water to raise sea levels more than 50 meters. 21. Drought-induced mortality of trees contributes to increased decomposition of carbon dioxide into the atmosphere and decreased sequestration of atmospheric carbon dioxide. Such mortality has been documented throughout the world since at least November 2000 in Nature, with recent summaries in the February 2013 issue ofNature for the tropics and in the August 2013 issue of Frontiers in Plant Science for temperate North America. Tropical rain forests, long believed to represent the primary driver of atmospheric carbon dioxide, are on the verge of giving up that role. According to a 21 May 2014 paper published in Nature, “the higher turnover rates of carbon pools in semi-arid biomes are an increasingly important driver of global carbon cycle inter-annual variability,” indicating the emerging role of drylands in controlling environmental conditions. 23. Sea-level rise causes slope collapse, tsunamis, and release of methane, as reported in the September 2013 issue of Geology. In eastern Siberia, the speed of coastal erosion has nearly doubled during the last four decades as the permafrost melts. 26. Small ponds in the Canadian Arctic are releasing far more methane than expected based on their aerial cover (PLoS ONE, November 2013). This is the first of several freshwater ecosystems releasing methane into the atmosphere, as reviewed in the 19 March 2014 issue of Nature and subsequently described by a large-scale study in the 28 April 2014 issue of Global Change Biology. 27. Mixing of the jet stream is a catalyst, too. High methane releases follow fracturing of the jet stream, accounting for past global-average temperature rises up to 16 C in a decade or two (Paul Beckwith via video on 19 December 2013). As nearly as I can distinguish, only the latter four feedback processes are reversible at a temporal scale relevant to our species. Once you pull the tab on the can of beer, there’s no keeping the carbon dioxide from bubbling up and out. These feedbacks are not additive, they are multiplicative: They not only reinforce within a feedback, the feedbacks also reinforce among themselves (as realized even by Business Insider on 3 October 2013). Now that we’ve entered the era of expensive oil, I can’t imagine we’ll voluntarily terminate the process of drilling for oil and gas in the Arctic (or anywhere else). Nor will we willingly forgo a few dollars by failing to take advantage of the long-sought Northwest Passage or make any attempt to slow economic growth. Through late March 2013, global oceans have risen approximately ten millimeters per year during the last two years. This rate of rise is over three times the rate of sea level rise during the time of satellite-based observations from 1993 to the present. Ocean temperatures are rising, and have been impacting global fisheries for four decades, according to the 16 May 2013 issue of Nature. Actually, catastrophe is already here, although it’s not widely distributed in the United States. Well, not yet, even though the continental U.S. experienced its highest temperature ever in 2012, shattering the 1998 record by a full degree Fahrenheit. But the east coast of North America experienced its hottest water temperatures all the way to the bottom of the ocean. The epic dust bowl of 2012 grew and grew and grew all summer long. As pointed out in the March 2004 issue ofGeophysical Research Letters, disappearing sea ice is expectedly contributing to the drying of the western United States (more definitive research on the topic appeared in the December 2005 issue of Earth Interactions). Equally expectedly, the drought arrived 40 years early. Even James Hansen and Makiko Sato are asking whether the loss of ice on Greenland has gone exponential (while ridiculously calling for a carbon tax to “fix” the “problem”), and the tentative answer is not promising, based on very recent data, including a nearly five-fold increase in melting of Greenland’s ice since the 1990s and a stunning melting of 98 percent of Greenland’s ice surface between 8 and 15 July 2012. ** The explanation for this astonishing event comes from a paper published in the 10 June 2014 issue of the Proceedings of National Academy of Sciences: “[T]he same mechanism drove two widespread melt events that occurred over 100 years apart, in 1889 and 2012. We found that black carbon from forest fires and rising temperatures combined to cause both of these events.” ** The mainstream media are finally taking notice, with the 18 July 2013 issue of Washington Post reporting the ninth highest April snow cover in the northern hemisphere giving way to the third lowest snow cover on record the following month (relevant records date to 1967, and the article is headlined, “Snow and Arctic sea ice extent plummet suddenly as globe bakes”). On a particularly dire note for humanity, climate change causes early death of 400,000 people each year causes early death of five million people each year. Adding to our misery are interactions between various aspects of environmental decay. For example, warming in the Arctic is causing the release of toxic chemicals long trapped in the region’s snow, ice, ocean and soil, according toresearch published in the 24 July 2011 issue of Nature Climate Change. Greenhouse-gas emissions keep rising, and keep setting records. According to 10 June 2013 report by the International Energy Agency, the horrific trend continued in 2012, when carbon dioxide emissions set a record for the fifth consecutive year. The trend puts disaster in the cross-hairs, with the ever-conservative International Energy Agency claiming we’re headed for a temperature in excess of 5 C.
Ice sheet loss continues to increase at both poles, and warming of the West Antarctic Ice Sheet is twice the earlier scientific estimate. Arctic ice at all-time low, half that of 1980, and the Arctic lost enough sea ice to cover Canada and Alaska in 2012 alone. In short, summer ice in the Arctic is nearly gone. Furthermore, the Arctic could well be free of ice by summer 2015, an event that last occurred some three million years ago, before the genus Homo walked the planet. Among the consequences of declining Arctic ice is extremes in cold weather in northern continents (thus illustrating why “climate change” is a better term than “global warming”). 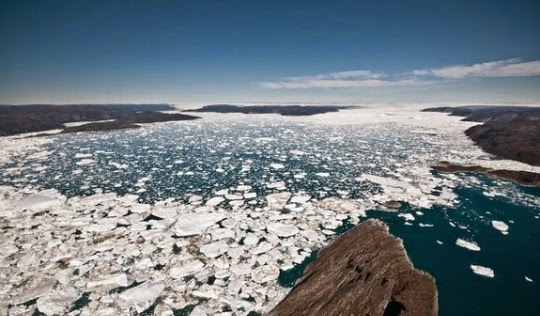 In a turn surprising only to mainstream climate scientists, Greenland ice is melting rapidly. Even the conservative International Energy Agency (IEA) has thrown in the towel, concluding that “renewable” energy is not keeping up with the old, dirty standard sources. As a result, the IEA report dated 17 April 2013 indicates the development of low-carbon energy is progressing too slowly to limit global warming. The Arctic isn’t Vegas — what happens in the Arctic doesn’t stay in the Arctic — it’s the planet’s air conditioner. In fact, as pointed out 10 June 2013 by research scientist Charles Miller of NASA’s Jet Propulsion Laboratory: “Climate change is already happening in the Arctic, faster than its ecosystems can adapt. Looking at the Arctic is like looking at the canary in the coal mine for the entire Earth system.” In addition, “average summer temperatures in the Canadian Arctic are now at the highest they’ve been for approaching 50,000 years” (and perhaps up to 120,000 years) according to a paper published online 23 October 2013 in Geophysical Research Letters. On the topic of rapidity of change, a paper in the August 2013 issue of Ecology Letters points out that rates of projected climate change dramatically exceed past rates of climatic niche evolution among vertebrate species. In other words, vertebrates cannot evolve or adapt rapidly enough to keep up with ongoing and projected changes in climate. An increasing number of scientists agree that warming of 4 to 6 C causes a dead planet. And, they go on to say, we’ll be there much sooner than most people realize. Earth-system scientist Clive Hamilton concludes in his April 2013 book Earthmasters that “without [atmospheric sulphates associated with industrial activity] … Earth would be an extra 1.1 C warmer.” In other words, collapse takes us directly to 2 C within a matter of weeks. According to a paper in the 24 November 2013 issue of Nature Climate Change, warming of the planet will continue long after emissions cease. Several other academic scientists have concluded, in the refereed journal literature no less, that the 2 C mark is essentially impossible (for example, see the review paper by Mark New and in the 29 November 2010 issue of the Philosophical Transactions of the Royal Society A). The German Institute for International and Security Affairs concluded 2 June 2013 that a 2 C rise in global-average temperature is no longer feasible (and Spiegel agrees, finally, in their 7 June 2013 issue), while the ultra-conservative International Energy Agency concludes that, “coal will nearly overtake oil as the dominant energy source by 2017 … without a major shift away from coal, average global temperatures could rise by 6 degrees Celsius by 2050, leading to devastating climate change.” At the 11:20 mark of this video, climate scientist Paul Beckwith indicates Earth could warm by 6 C within a decade. If you think his view is extreme, consider (1) the 5 C rise in global-average temperature 55 million years ago during a span of 13 years (reported in the 1 October 2013 issue of Proceedings of the National Academy of Sciences), and also (2) the reconstruction of regional and global temperature for the past 11,300 years published in Science in March 2013. One result is shown in the figure below. It’s not merely scientists who know where we’re going. The Pentagon is bracing for public dissent over climate and energy shocks, as reported by Nafeez Ahmed in the 14 June 2013 issue of theGuardian. According to Ahmed’s article: “Top secret US National Security Agency (NSA) documents disclosed by the Guardian have shocked the world with revelations of a comprehensive US-based surveillance system with direct access to Facebook, Apple, Google, Microsoft and other tech giants. New Zealand court records suggest that data harvested by the NSA’s Prism system has been fed into the Five Eyes intelligence alliance whose members also include the UK, Canada, Australia and New Zealand.” In short, the “Pentagon knows that environmental, economic and other crises could provoke widespread public anger toward government and corporations” and is planning accordingly. Such “activity is linked to the last decade of US defence planning, which has been increasingly concerned by the risk of civil unrest at home triggered by catastrophic events linked to climate change, energy shocks or economic crisis — or all three.” In their 2014 Quadrennial Defense Review, the U.S. military concludes: “Climate change poses another significant challenge for the United States and the world at large. As greenhouse gas emissions increase, sea levels are rising, average global temperatures are increasing, and severe weather patterns are accelerating.” The global police state has arrived, and it’s accompanied by a subtle changes in Earth’s rotation that result from the melting of glaciers and ice sheets (i.e., climate change is causing Earth’s poles to shift). Guy-3Min from Pauline Schneider on Vimeo. Guy McPherson—"How Do We Act in the Face of Climate Chaos?" Wow 38! Yep the planet is in complete control now - and will decide just how fast things go and how bad they get. I suspect faster than almost anyone ever predicted. Just about every plant I know is growing way beyond it's normal size and producing so many seeds. I've heard that this has been seen in trees before - when they are stressed they take a last chance to propagate en masse as they might die. As they say, that "missing heat" most likely went into the land masses instead. Are you a Simpson's fan? I also think Seymour rocks, but my fav character is definitely Lisa. Thanks for this blog, it's fantastic!